These diversified Indian tribes also called the denotified and nomadic tribes constitute some 5 million of population in Maharashtra. 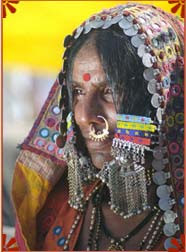 These tribes of India are very popular amongst tourist because of their culture and traditions. One thing that also catches the eye is the fact that these tribes generally live in geographically isolated places. Let us find out some major interest areas of these tribes. Culture is totally unique. The faiths, dress, festivals ands even the languages are different and not to be found anywhere in India. People usually prefer visiting these tribes because of their lifestyle and conduct. The lifestyle is simple to say the least. Most of these Indian tribes are engaged in occupation like agriculture and the food they eat is depended mostly on their work input. The earlier posts have also put a lot of stress on the different life styles of various tribes of India. So, the Maharashtra tribes are no different. Every year annually they these tribes assemble at Madhi village in Nagar district of Maharashtra and discuss various issues that confront these tribes. In the nut shell these tribes of Maharashtra are a must visit and an integral part of your Indian tribal tour. Sir excellent blog on Tribes of India. Sir i hope you heard about Warli Tribe of Maharashtra and Warli paintings. Sir these are my Warli paintings greetings cards. Sir i want to use your blog's information and photos on my Heritage of India blog if you are gibing me permission. sir i request yu please look into my blog and give your valuable comments and also please give me permission for using your blog's valuable information on Tribal culture of several tribes of india.